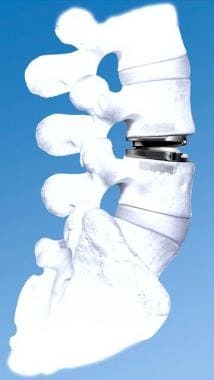 In recent decades, increased understanding of spinal biomechanics, proliferation of sophisticated spinal instrumentation devices, advances in bone fusion techniques, refinement of anterior approaches to the spine, and development of microsurgical and minimally invasive methods have made it possible to stabilize every segment of the spine successfully, regardless of the offending pathology. Accordingly, use of spinal fusion and instrumentation has increased. The question facing the modern spine surgeon is not so much how to stabilize the spine but when to do so. In this setting, clinical practice is guided by an understanding of the principles of spinal biomechanics (see Pathophysiology) and knowledge of the generally accepted indications, contraindications, and controversies regarding fusion surgery (see Treatment). It should be noted that whereas the term fusion, as used in this article and in spine literature to refer to the concept of internal stabilization of the spine, generally refers to fusion with instrumentation (instrumented fusion), such stabilization has also, albeit with decreasing frequency, been accomplished by means of bone grafting alone. A great deal of controversy remains regarding the application of fusion surgery in the treatment of degenerative spine disease without overt instability. In the future, these controversies will be addressed by a two-pronged approach. First, rigorous randomized controlled trials are needed to better assess the efficacy of existing methods of fusion. Second, novel treatment strategies are needed to replace fusion surgery. Artificial lumbar disk. 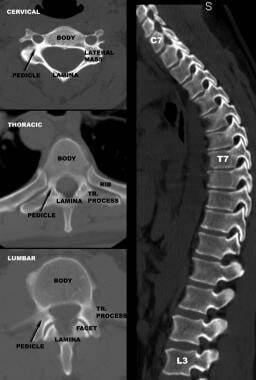 Image courtesy of Synthes, Inc.
A prospective, randomized, controlled multicenter study designed to show the "noninferiority" of cervical total disk replacement (TDR) revealed that this technology was at least equivalent to anterior cervical diskectomy and fusion with regard to outcome at 24 months. Although most primary outcome measures (eg, pain scores and neurologic success) were equivalent in the two groups, the disk replacement group showed a lower requirement for analgesics and lower reoperation rate than the fusion group at 24 months. Although these results show promise for total disk replacement, it should be noted that this study was limited to patients with single-level disk disease with radiculopathy and and that the results therefore cannot be generalized to patients with multilevel disk herniations, spondylosis, spondylolisthesis, and degenerative disk disease. In addition, long-term follow-up studies are needed to determine whether these benefits last, whether motion preservation with artificial disks persists over the long term, and whether the frequency of transition-level syndrome is decreased. The challenges facing artificial disks and posterior dynamic stabilization devices are twofold. First, they must improve upon lumbar fusion outcomes. Second, these mechanical devices must continue to function indefinitely, as opposed to current spine implants, which are shielded from biomechanical stress once bony fusion is achieved. In the long-term future, biologic rather than mechanical treatment strategies directed at repairing and maintaining the degenerated spine elements are more likely to provide a satisfactory solution to the problem of degenerative spine disease. Regional variations in vertebral anatomy affect the incidence and consequences of spinal instability in different parts of the spine and dictate the surgical means by which the spine can be stabilized. Vertebral body size increases as one descends the spine, accompanied by a corresponding increase in vertebral axial load-bearing capacity. The greater cancellous-to-cortical bone ratio in the vertebral body as compared with the posterior vertebral elements makes the body more susceptible to neoplastic and infectious diseases, and its relation to the instantaneous axis of rotation (IAR) makes it more susceptible to compressive injuries. The relative preponderance of these disorders anterior to the spinal cord makes their surgical management more challenging, often necessitating an anterior surgical approach to the spine. On the other hand, the large surface area and volume of the vertebral body make it an excellent target for insertion of screw/plate systems, which can be used to stabilize every segment of the subaxial spine. Facet joints have a transverse orientation in the cervical spine and gradually acquire a more sagittal orientation throughout the thoracic and upper lumbar spine. They then become more coronally oriented as one descends the lumbar spine. The transverse orientation of the facet joints and the loose facet capsules in the cervical spine allow relatively free movement of the neck in all three planes and do not protect the cervical spine against flexion injuries. In the thoracolumbar junction, the sagittal orientation of the facet joints and the strong capsular ligaments permit greater movement in the sagittal plane than in other directions. This facet orientation and the transitional location of the thoracolumbar spine between the ribcage-stabilized thoracic spine and the more robust lumbar spine make the thoracolumbar junction more susceptible to flexion injuries. The more coronal orientation of the L5-S1 facet joints as compared with the L4-5 facets accounts for the lower incidence of degenerative spondylolisthesis at L5-S1, in spite of the biomechanically disadvantaged angle of the lumbosacral junction. In contrast, isthmic spondylolisthesis, where the presence of spondylolysis bypasses the resistance of facet joints against translation, is more frequent at L5-S1. The spinal canal is narrowest in the thoracic spine. On the other hand, the thoracic spine is stabilized by the ribcage, making it relatively immune to degenerative instability and increasing its resistance to traumatic instability. Consequently, if the force vector is great enough to overcome the stability of thoracic spine and produce a fracture-dislocation, the likelihood and severity of spinal cord injury would be greater in this area than elsewhere in the spine. The pedicles in the cervical spine are quite narrow, short, acutely oriented, and juxtaposed to the transverse foramina (of the vertebral artery); accordingly, they are relatively undesirable for screw insertion. In contrast, the large size, strength, and favorable cylindrical anatomy of the pedicles in the lumbar spine makes them ideal for screw insertion. The pedicle screws at different segments are then linked by rods to stabilize the spine. The pedicles acquire a relatively sagittal orientation in the thoracic and upper lumbar spine but then point inward again as one approaches the sacrum, a fact that must be taken into account when pedicle screws are to be inserted. In the thoracic spine, the pedicles have a narrow transverse diameter, exhibit a slight downward angle, and are located next to the narrow thoracic spinal canal. Because of these anatomic considerations, wires and hooks have been used more frequently than screws to anchor rods against the thoracic spine, necessitating long instrumentation constructs to stabilize a short segment of instability ("rod long, fuse short"). Increasingly, screws are used in the thoracic spine to create shorter and stronger instrumentation constructs. In this setting, it is imperative to select screws of appropriate diameter on the basis of preoperative computed tomography (CT) and to avoid breach of the medial pedicle wall, erring toward the laterally located and protective costovertebral articulation, if necessary. On the other hand, the relatively generous sagittal diameter of thoracic pedicles and the smaller size and lesser functional importance of thoracic nerve roots make screw misdirection in the sagittal plane less costly in the thoracic spine than it would be in the lumbar spine. Cervical vertebrae have anatomic structures not found elsewhere in the spine: the lateral masses. Juxtaposed between the pedicles and the lamina and delimited by the articular surfaces of the adjacent facet joints, the paired lateral masses are satisfactory targets for screw insertion. Lateral mass screws at adjacent segments are linked by plates or rods to stabilize the cervical spine. Laminae, spinous processes, and transverse processes can be used as anchor points for wires and hooks connected to rods to form three-point-bending instrumentation constructs. Alternatively, these structures can be wired to each other at different segments to produce tension band constructs. In general, these types of constructs provide less stiffness than screw/rod or screw/plate systems. Comparison of vertebral anatomy in cervical, thoracic, and lumbar spine. Note variation in anatomy and size of pedicles. The pathophysiology of spinal instability is variable and dependent on the etiology of instability. However, an understanding of certain biomechanical principles can guide the surgeon in diagnosing spinal instability and selecting the appropriate treatment method. Failure of two or more columns generally results in instability. In this context, a simple compression wedge fracture occurs as a consequence of failure of the anterior column with preservation of the middle column (stable). On the other hand, a burst fracture is due to compression failure of both the anterior and the middle column (usually unstable), often resulting in bone retropulsion into spinal canal. A seatbelt-type injury is attributed to distraction failure of the posterior and middle columns with hinging of an intact anterior column (unstable). Fracture-dislocations involve failure of all three columns and are considered highly unstable. 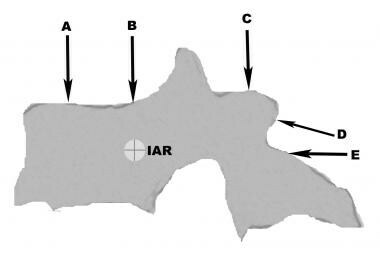 The IAR is the axis about which a vertebral segment would rotate when exposed to an asymmetric application of force. Although in theory, there are three axes of rotation—corresponding to rotation in the sagittal plane (flexion/extension), coronal plane (lateral bending), and axial plane (twisting)—in practice, most references to the IAR involve axial forces applied in the sagittal plane. The IAR commonly (but not necessarily) falls within Denis' middle column. Force vectors are simple mathematical constructs that define not only the magnitude of a force but also its direction. A force vector applied at a distance to the IAR results in rotation of that vertebral segment about the IAR. The distance between the point of application of the force vector and the IAR is called the moment arm. The longer the moment arm is, the less force is required to produce rotation. When unrestricted rotation or displacement of an object is not possible in response to a force vector, deformation of its material (in this case, bone) occurs. For solid objects, elastic deformation occurs if the material can resume its shape when the stress (force divided by cross-sectional area) is removed. With increasing stress, a threshold is reached (elastic yield point) beyond which irreversible but smooth deformation (plastic deformation) occurs. With further increases in stress, another threshold is reached (ultimate tensile point or failure point), at which point a fracture occurs and the stress is relieved. In the case of vertebral bone, the elastic yield point and failure point are fairly close, so the very little plastic deformation takes place before a fracture occurs. On the basis of these concepts, traumatic spinal instability can be categorized according to the underlying pathophysiologic mechanisms. When an axial force vector is applied anterior to the IAR, a compression fracture occurs as a result of isolated failure of the anterior column. When the axial force vector is precisely directed over the IAR, no rotation occurs. In this situation, if the stress exceeds the ultimate tensile point of the vertebral bone, failure of both middle and anterior columns occurs, resulting in a burst fracture. If the axial force vector is directed posterior to the IAR (hyperextension), fractures of laminae and facet joint may result. This is more common in the cervical spine because of its lordotic curvature. Pure distraction forces are rarely applied to the spine. Distraction-flexion force vectors are composite vectors with components in the superior and anterior orientation in the sagittal plane, generally associated with seatbelt deceleration injuries of the thoracolumbar spine. The vertical (distractive) component of the vector is applied posterior to the IAR, whereas the flexion component is directed superior to the IAR, resulting in rupture of the posterior ligamentous complex and the middle column. The anterior column remains intact, acting as a hinge. In this type of injury, if the orientation of the vector is such that the flexion component is stronger and is directly applied to the IAR, a true Chance fracture may occur, consisting of a horizontal shearing fracture across the pedicles, the vertebral endplates, or both. (See the image below.) With even larger flexion force vectors, a fracture-dislocation may occur, with failure of all three columns and bilateral jumped or fractured facets. If a rotational vector (twisting moment) is also present in the axial plane and the flexion vector is not overwhelming, a unilateral jumped facet may result. (A) Compression fracture; (B) burst fracture; (C) hyperextension injury to lamina and facets; (D) flexion-distraction (seatbelt) ligamentous injury and Chance fracture; (E) shear fracture-dislocations. Although these biomechanical concepts are often discussed in the context of traumatic instability, they can be extended to other forms of instability as well. Furthermore, they are commonly applied in devising fusion and instrumentation constructs to treat specific instances of spinal instability. For instance, interbody bone grafts and cages are best applied as distraction constructs applied in the region of IAR. Pedicle screw constructs can act as cantilever beams, shifting the IAR to the rod-screw interface. (See the image below.) Consideration of IAR is of crucial importance in three-point-bending constructs (eg, universal hook, wire, screw, rod systems used for thoracolumbar posterior instrumentation), where application of compressive and distractive forces can have significant effects on spine contour. 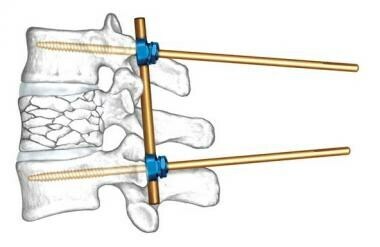 Example of application of biomechanical principles to spine surgery. Insertion of special pedicle screws (Schanz screws) pivoting on rod transfers instantaneous axis of rotation (IAR) to screw-rod interface. Compression of proximal end of screws produces distraction-reduction of vertebral burst fracture. If posterior longitudinal ligament is intact, retropulsion is corrected by ligament taxis. Image courtesy of Synthes, Inc.
Osteoconduction refers to the capacity of the graft to serve as a matrix or scaffolding for infiltration of bone cells and supporting neovascular network. Allogeneic, autologous, and synthetic bone matrices made of hydroxyapatite or coral are osteoconductive. Osteoinduction refers to the capacity of bone to direct differentiation, migration and attachment of osteoprogenitor cells. Many positive and negative osteoinductive influences exist. Bone morphogenic protein, a member of the transforming growth factor (TGF)-β family, induces differentiation of mesenchymal cells into osteoblasts. It is found naturally in the bone fusion environment and is available in recombinant form for clinical use. Compressive forces applied to the bone graft also promote increased bone deposition, accounting for the greater success of interbody bone grafts versus onlay bone grafts. Application of a direct electrical current to bone also has an osteoinductive influence,  a phenomenon that is put to use by implanting a bone stimulator in cases at high risk for pseudarthrosis. Osteogenesis refers to the capacity of bone graft to initiate fusion by providing live osteoprogenitor cells. Only autologous bone graft has this property. In addition to osteogenesis, autologous bone graft provides osteoinduction and osteoconduction and thus is the ideal graft material. A corticocancellous autograft (eg, a tricortical iliac crest autograft) is capable of providing structural support as an interbody implant in addition to the abovementioned favorable properties. The only drawback of using autograft material is the potential for donor-site complications associated with graft harvest. Of these, smoking is the most prevalent correctable risk factor. There is abundant experimental and clinical  evidence documenting the adverse effects of smoking on bone healing and fusion. Finally, immobilization of the target motion segment has been shown to significantly enhance the success of fusion. This is best accomplished by means of instrumentation. In absence of instrumentation, fusion should be supported by external bracing until it solidifies. Given that spinal instability is not a single disease but a pathologic consequence of a variety of different spine disorders (eg, traumatic fractures, metastatic tumors,  and degenerative conditions), each with its own epidemiology, it is not possible or meaningful to determine the incidence and prevalence of spinal instability in the population. Furthermore, because of the disagreements on indications for spine fusion (at least for degenerative disease), the incidence of spinal instability does not correlate with the observed frequency of spine fusion surgery. An increase in the incidence of spinal instability certainly could not account for the increase in fusion surgery. Although the forces driving this trend may be debated, it is clear that the standard of care in the United States has been shifting toward greater use of fusion surgery. With overt instability (eg, from trauma, tumor, or infection), neurologic function after surgery is directly related to preoperative neurologic status and cannot be used as a measure of success of fusion surgery. For instance, after a thoracolumbar fracture-dislocation with cord laceration and paraplegia, the success of fusion surgery should not be measured in terms of recovery of neurologic function, but in terms of addressing disabling deformity and pain. In conditions with overt instability, deformity and pain outcome measures correlate closely with radiographic success of fusion. Modern fusion and instrumentation techniques ensure radiographic success in most of these cases; thus, the outcome of fusion surgery for treatment of overt instability is generally good, and the necessity of lumbar fusion for overt instability is not questioned. The situation is entirely different in the case of covert instability as it applies to degenerative disease, where there is not a strong correlation between successful radiographic fusion and clinical improvement, and the former cannot be used as a surrogate marker for the latter. Consequently, there is now a great deal of interest in direct assessment of clinical outcome after fusion surgery for degenerative spine disease. In a multicenter randomized controlled trial, the Swedish Lumbar Spine Study Group provided useful class I scientific evidence. Of the 294 patients with disabling back pain due to one- or two-level degenerative disease without spinal stenosis or spondylolisthesis (covert instability: dysfunctional motion segment), the lumbar fusion group did significantly better than the conservatively treated group in terms of pain relief, degree of disability, return to work status, and degree of satisfaction. In contrast to this trial, a smaller Norwegian study of degenerative back pain  failed to show a statistically significant difference between lumbar fusion and a very aggressive regimen of physical and cognitive treatment (25 hours of physical therapy weekly for 8 weeks, followed by a comprehensive home exercise program, individual counseling, lessons, group therapy sessions, and peer group discussions). Both groups experienced significant improvements over baseline, with a trend toward greater improvement in the surgical group. This study was criticized not only for its small number of patients but also for the large confidence intervals in the data, which suggested that it lacked sufficient power to detect a statistical difference. Furthermore, it is unclear whether large-scale implementation of such a vigorous physical and cognitive program is realistic in the everyday clinical setting. Such discrepancies in the spine literature have generally been the norm, not the exception, and they have often arisen from studies of far less scientific rigor than those mentioned above. White AA, Panjabi MM. Clinical Biomechanics of the Spine. 2nd ed. Philadelphia: Lippincott; 1990. 30-342. Lin EL, Wang JC. Total disk arthroplasty. J Am Acad Orthop Surg. 2006 Dec. 14(13):705-14. [Medline]. Murrey D, Janssen M, Delamarter R, Goldstein J, Zigler J, Tay B, et al. Results of the prospective, randomized, controlled multicenter Food and Drug Administration investigational device exemption study of the ProDisc-C total disc replacement versus anterior discectomy and fusion for the treatment of 1-level symptomatic cervical disc disease. Spine J. 2009 Apr. 9(4):275-86. [Medline]. Schwarzenback O, Berlemann U, Stoll TM, Dubois G. Posterior dynamic stabilization systems: DYNESYS. Orthop Clin North Am. 2005. 36(3):363-72. [Medline]. Denis F. Spinal instability as defined by the three-column spine concept in acute spinal trauma. Clin Orthop Relat Res. 1984 Oct. (189):65-76. [Medline]. Mohan S, Baylink DJ. Bone growth factors. Clin Orthop Relat Res. 1991 Feb. (263):30-48. [Medline]. Kane WJ. Direct current electrical bone growth stimulation for spinal fusion. Spine. 1988 Mar. 13(3):363-5. [Medline]. Brown CW, Orme TJ, Richardson HD. The rate of pseudarthrosis (surgical nonunion) in patients who are smokers and patients who are nonsmokers: a comparison study. Spine. 1986 Nov. 11(9):942-3. [Medline]. Bridwell KH, Sedgewick TA, O'Brien MF, Lenke LG, Baldus C. The role of fusion and instrumentation in the treatment of degenerative spondylolisthesis with spinal stenosis. J Spinal Disord. 1993 Dec. 6(6):461-72. [Medline]. Weber MH, Burch S, Buckley J, Schmidt MH, Fehlings MG, Vrionis FD, et al. Instability and impending instability of the thoracolumbar spine in patients with spinal metastases: a systematic review. Int J Oncol. 2011 Jan. 38 (1):5-12. [Medline]. Rajaee SS, Bae HW, Kanim LE, Delamarter RB. Spinal fusion in the United States: analysis of trends from 1998 to 2008. Spine (Phila Pa 1976). 2012 Jan 1. 37 (1):67-76. [Medline]. Deyo RA, Nachemson A, Mirza SK. Spinal-fusion surgery - the case for restraint. N Engl J Med. 2004 Feb 12. 350(7):722-6. [Medline]. Patil PG, Turner DA, Pietrobon R. National trends in surgical procedures for degenerative cervical spine disease: 1990-2000. Neurosurgery. 2005 Oct. 57(4):753-8; discussion 753-8. [Medline]. Salzmann SN, Derman PB, Lampe LP, Kueper J, Pan TJ, Yang J, et al. Cervical Spinal Fusion: 16-Year Trends in Epidemiology, Indications, and In-hospital Outcomes by Surgical Approach. World Neurosurg. 2018 Feb 10. [Medline]. Fritzell P, Hagg O, Wessberg P, Nordwall A,. 2001 Volvo Award Winner in Clinical Studies: Lumbar fusion versus nonsurgical treatment for chronic low back pain: a multicenter randomized controlled trial from the Swedish Lumbar Spine Study Group. Spine. 2001 Dec 1. 26(23):2521-32; discussion 2532-4. [Medline]. Brox JI, Sørensen R, Friis A, Nygaard Ø, Indahl A, Keller A, et al. Randomized clinical trial of lumbar instrumented fusion and cognitive intervention and exercises in patients with chronic low back pain and disc degeneration. Spine. 2003 Sep 1. 28(17):1913-21. [Medline]. [Guideline] Resnick DK, Choudhri TF, Dailey AT, Groff MW, Khoo L, Matz PG, et al. Guidelines for the performance of fusion procedures for degenerative disease of the lumbar spine. Part 1: introduction and methodology. J Neurosurg Spine. 2005 Jun. 2 (6):637-8. [Medline]. [Guideline] Kaiser MG, Eck JC, Groff MW, Watters WC 3rd, Dailey AT, Resnick DK, et al. Guideline update for the performance of fusion procedures for degenerative disease of the lumbar spine. Part 1: introduction and methodology. J Neurosurg Spine. 2014 Jul. 21 (1):2-6. [Medline]. [Full Text]. [Guideline] Ghogawala Z, Resnick DK, Watters WC 3rd, Mummaneni PV, Dailey AT, Choudhri TF, et al. Guideline update for the performance of fusion procedures for degenerative disease of the lumbar spine. Part 2: assessment of functional outcome following lumbar fusion. J Neurosurg Spine. 2014 Jul. 21 (1):7-13. [Medline]. [Full Text]. [Guideline] Ghogawala Z, Whitmore RG, Watters WC 3rd, Sharan A, Mummaneni PV, Dailey AT, et al. Guideline update for the performance of fusion procedures for degenerative disease of the lumbar spine. Part 3: assessment of economic outcome. J Neurosurg Spine. 2014 Jul. 21 (1):14-22. [Medline]. [Full Text]. [Guideline] Choudhri TF, Mummaneni PV, Dhall SS, Eck JC, Groff MW, Ghogawala Z, et al. Guideline update for the performance of fusion procedures for degenerative disease of the lumbar spine. Part 4: radiographic assessment of fusion status. J Neurosurg Spine. 2014 Jul. 21 (1):23-30. [Medline]. [Full Text]. [Guideline] Dhall SS, Choudhri TF, Eck JC, Groff MW, Ghogawala Z, Watters WC 3rd, et al. Guideline update for the performance of fusion procedures for degenerative disease of the lumbar spine. Part 5: correlation between radiographic outcome and function. J Neurosurg Spine. 2014 Jul. 21 (1):31-6. [Medline]. [Full Text]. [Guideline] Eck JC, Sharan A, Resnick DK, Watters WC 3rd, Ghogawala Z, Dailey AT, et al. Guideline update for the performance of fusion procedures for degenerative disease of the lumbar spine. Part 6: discography for patient selection. J Neurosurg Spine. 2014 Jul. 21 (1):37-41. [Medline]. [Full Text]. [Guideline] Eck JC, Sharan A, Ghogawala Z, Resnick DK, Watters WC 3rd, Mummaneni PV, et al. Guideline update for the performance of fusion procedures for degenerative disease of the lumbar spine. Part 7: lumbar fusion for intractable low-back pain without stenosis or spondylolisthesis. J Neurosurg Spine. 2014 Jul. 21 (1):42-7. [Medline]. [Full Text]. [Guideline] Wang JC, Dailey AT, Mummaneni PV, Ghogawala Z, Resnick DK, Watters WC 3rd, et al. Guideline update for the performance of fusion procedures for degenerative disease of the lumbar spine. Part 8: lumbar fusion for disc herniation and radiculopathy. J Neurosurg Spine. 2014 Jul. 21 (1):48-53. [Medline]. [Full Text]. [Guideline] Resnick DK, Watters WC 3rd, Sharan A, Mummaneni PV, Dailey AT, Wang JC, et al. Guideline update for the performance of fusion procedures for degenerative disease of the lumbar spine. Part 9: lumbar fusion for stenosis with spondylolisthesis. J Neurosurg Spine. 2014 Jul. 21 (1):54-61. [Medline]. [Full Text]. [Guideline] Resnick DK, Watters WC 3rd, Mummaneni PV, Dailey AT, Choudhri TF, Eck JC, et al. Guideline update for the performance of fusion procedures for degenerative disease of the lumbar spine. Part 10: lumbar fusion for stenosis without spondylolisthesis. J Neurosurg Spine. 2014 Jul. 21 (1):62-6. [Medline]. [Full Text]. [Guideline] Mummaneni PV, Dhall SS, Eck JC, Groff MW, Ghogawala Z, Watters WC 3rd, et al. Guideline update for the performance of fusion procedures for degenerative disease of the lumbar spine. Part 11: interbody techniques for lumbar fusion. J Neurosurg Spine. 2014 Jul. 21 (1):67-74. [Medline]. [Full Text]. [Guideline] Groff MW, Dailey AT, Ghogawala Z, Resnick DK, Watters WC 3rd, Mummaneni PV, et al. Guideline update for the performance of fusion procedures for degenerative disease of the lumbar spine. Part 12: pedicle screw fixation as an adjunct to posterolateral fusion. J Neurosurg Spine. 2014 Jul. 21 (1):75-8. [Medline]. [Full Text]. [Guideline] Watters WC 3rd, Resnick DK, Eck JC, Ghogawala Z, Mummaneni PV, Dailey AT, et al. Guideline update for the performance of fusion procedures for degenerative disease of the lumbar spine. Part 13: injection therapies, low-back pain, and lumbar fusion. J Neurosurg Spine. 2014 Jul. 21 (1):79-90. [Medline]. [Full Text]. [Guideline] Dailey AT, Ghogawala Z, Choudhri TF, Watters WC 3rd, Resnick DK, Sharan A, et al. Guideline update for the performance of fusion procedures for degenerative disease of the lumbar spine. Part 14: brace therapy as an adjunct to or substitute for lumbar fusion. J Neurosurg Spine. 2014 Jul. 21 (1):91-101. [Medline]. [Full Text]. [Guideline] Sharan A, Groff MW, Dailey AT, Ghogawala Z, Resnick DK, Watters WC 3rd, et al. Guideline update for the performance of fusion procedures for degenerative disease of the lumbar spine. Part 15: electrophysiological monitoring and lumbar fusion. J Neurosurg Spine. 2014 Jul. 21 (1):102-5. [Medline]. [Full Text]. [Guideline] Kaiser MG, Groff MW, Watters WC 3rd, Ghogawala Z, Mummaneni PV, Dailey AT, et al. Guideline update for the performance of fusion procedures for degenerative disease of the lumbar spine. Part 16: bone graft extenders and substitutes as an adjunct for lumbar fusion. J Neurosurg Spine. 2014 Jul. 21 (1):106-32. [Medline]. [Full Text]. [Guideline] Kaiser MG, Eck JC, Groff MW, Ghogawala Z, Watters WC 3rd, Dailey AT, et al. Guideline update for the performance of fusion procedures for degenerative disease of the lumbar spine. Part 17: bone growth stimulators as an adjunct for lumbar fusion. J Neurosurg Spine. 2014 Jul. 21 (1):133-9. [Medline]. [Full Text]. Benzel EC. Stability and instability of the spine. Biomechanics of Spine Stabilization. 3rd ed. New York: Thieme; 2015. Chap 3. Ailon T, Smith JS, Shaffrey CI, Lenke LG, Brodke D, Harrop JS, et al. Degenerative Spinal Deformity. Neurosurgery. 2015 Oct. 77 Suppl 4:S75-91. [Medline]. Schulte TL, Ringel F, Quante M, Eicker SO, Muche-Borowski C, Kothe R. Surgery for adult spondylolisthesis: a systematic review of the evidence. Eur Spine J. 2016 Aug. 25 (8):2359-67. [Medline]. Harrington PR. The history and development of Harrington instrumentation. Clin Orthop Relat Res. 1973 Jun. (93):110-2. [Medline]. Abbott AD, Tyni-Lenné R, Hedlund R. Early rehabilitation targeting cognition, behavior, and motor function after lumbar fusion: a randomized controlled trial. Spine (Phila Pa 1976). 2010 Apr 15. 35(8):848-57. [Medline]. Hu HM, Chen L, Frary CE, Chang CC, Hui H, Zhang HP, et al. The beneficial effect of Batroxobin on blood loss reduction in spinal fusion surgery: a prospective, randomized, double-blind, placebo-controlled study. Arch Orthop Trauma Surg. 2015 Apr. 135 (4):491-7. [Medline]. Kushioka J, Yamashita T, Okuda S, Maeno T, Matsumoto T, Yamasaki R, et al. High-dose tranexamic acid reduces intraoperative and postoperative blood loss in posterior lumbar interbody fusion. J Neurosurg Spine. 2017 Mar. 26 (3):363-367. [Medline]. Antwi P, Grant R, Kuzmik G, Abbed K. "White Cord Syndrome" of Acute Hemiparesis after Posterior Cervical Decompression and Fusion for Chronic Cervical Stenosis. World Neurosurg. 2018 Feb 13. [Medline]. Spinal fusion surgery for relief of chronic lower back pain. Procedure performed by John Ciccarelli, MD, Shawnee Mission Medical Center, Shawnee, KS. Video courtesy of BroadcastMed (https://www.broadcastmed.com/orthopedics/4033/videos/spinal-fusion-surgery-for-relief-of-chronic-lower-back-pain). Bilateral jumped facet syndrome is example of overt spinal instability due to trauma. Note grossly abnormal displacement of C5 relative to C6 with neck flexion. Example of anticipated instability. (A) Large mass affecting right C3-4 facet joint and lateral masses in patient with severe right-side neck and shoulder pain; (B, C) complete resection of tumor and simultaneous C3-4 anterior fusion to circumvent anticipated iatrogenic stability produced by radical resection of facet and lateral masses. Spinal stenosis with fixed degenerative spondylolisthesis in elderly patient is common example of covert instability. Acceptable surgical treatment options include decompression alone vs decompression with fusion. Loosening of this infected pedicle screw is evidenced by radiolucent halo (arrows) surrounding screw. In this patient with T7-8 diskitis, vertebral enhancement on MRI persisted 8 weeks after clinical and microbiologic cure. Grade 1 spondylolisthesis in neutral position progresses to grade 2 with flexion, indicating overt instability in this case. Grade I isthmic spondylolisthesis at L5-S1. Arrow depicts L5 pars fracture. C1-2 fusion with cable fixation (Gallie technique). In this case, fusion is supplemented with transarticular screws. C1-2 fusion and cable fixation (Brooks technique). Image courtesy of Synthes, Inc.
C1-2 fusion with cable fixation (Sonntag technique): coronal (left) and sagittal (right) CT reconstructions. C1-2 transarticular screw. Note proximity of vertebral artery to typical screw trajectory. Anterior cervical plate, applied in this case after two-level anterior cervical diskectomy and fusion. Image courtesy of Synthes, Inc.
Large central disk herniations (A, B) and cervical spondylotic myelopathy with kyphosis (C) are two common indications for anterior cervical diskectomy and fusion. C5-6 bilateral jumped facets associated with disk herniation (left) was treated with C6 anterior cervical decompression and fusion (right). Anterior cervical diskectomy and fusion. (A) Disk removed and interspace prepared to receive graft; (B) iliac crest bone graft harvested; (C) bone graft; (D) graft inserted into disk space; (E) plate screwed to anterior surface of vertebral bodies. Intraoperative fluoroscopy for pedicle screw insertion. Pedicle screw fixation of lumbar spine. Image courtesy of Synthes, Inc. Combined interbody and posterolateral lumbar fusion with pedicle screws: coronal (left) and sagittal (right) CT reconstructions. Anterolateral lumbar corpectomy followed by reconstruction with fixed-height cage and dynamic rod system that allows compression across cage. Image courtesy of Synthes, Inc.
Modular posterior thoracolumbar instrumentation system, which is attached to spine by combination of screws and hooks, in turn attached to long rods. In this case, it is used for correction of scoliosis, using three-point bending biomechanical principles. Image courtesy of Synthes, Inc.
Anterolateral thoracic corpectomy followed by reconstruction with expandable cage and fixed plate-screw system. Image courtesy of Synthes, Inc.
Anteroposterior and lateral radiographs of anterior thoracic corpectomy and reconstruction for pathologic fracture due to vertebral osteomyelitis. Modern operating room setup for spine surgery with fluoroscopy unit, neurophysiologic monitoring equipment, operating microscope, and digital radiology monitors. Transition level syndrome: C6-7 disc herniation developed 6 years after C4-5 and C5-6 anterior cervical diskectomy and fusion. Images 5, 12, 15, 20, 22, 23, 24, and 28 are protected by copyright under Synthes, Inc. or its affiliates; West Chester, Pennsylvania. The efforts of Mr. Jamison Wolocko and Ms. Cynthia Ryen in securing and providing these illustrations for this article are gratefully acknowledged.